3 Ways To Avoid Makeup Meltdown At Summer Weddings! One of the most popular wedding-beauty questions you guys have sent melately is: What's the best way to keep makeup from sliding right off during a steamy, outdoor summer wedding? 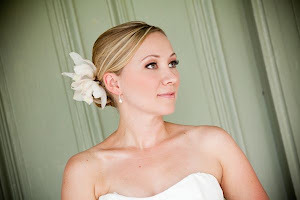 Here are some of our best tips for helping your wedding-day makeup keep its cool. 1. Prep skin with an oil-absorbing base. Use moisturizer only where necessary, and then smooth on a light lotion or primer designed to absorb excess moisture off your skin's surface. Two that dermatologists and makeup artists swear by: Smashbox Photo Finish Foundation Primer and Vichy Normaderm Pro Mat. When you blend your foundation on top, it'll stay seamless and smooth for much longer, even when you sweat. Be sure to set your makeup with powder, too; just leave your cheeks powder-free (or more lightly powdered) if you want to maintain a glowy look. 2. Layer your eye makeup. To keep liner and shadow from migrating amidst humidity and sweat, start with an eyeshadow primer that works similarly to the foundation primers mentioned above (but formulated so as not to irritate your eyes). Then, use a clean eyeshadow brush to dust on a bit of translucent face powder before applying your eye makeup. When you're done, dust on one more layer as extra insurance, to really set the color. 3. Mist on a setting spray. When your face is fully finished, lock the makeup in place by spritzing on a spray designed to help offset the effects of heat and humidity, like Make Up For Ever Mist & Fix or Model in a Bottle. Or my my newest fav is urban Decay " All Nighter spray"
Finally, be sure to tuck some blotting papers in your clutch so you can sop up oil and sweat during bathroom trips without wiping off your meticulously applied makeup.